This work comes from a student* in my field biology class. Part of the course includes students keeping a “field journal“, and that assignment allows an opportunity for students to express their thoughts and observations about nature in many different ways, from writing, to art, and poetry. Why could nectar not quench your hunger, like your male counterpart? Why must you thirst for my blood? But to what lengths will you go to continue your lineage? Was it my personality that drew you in? Or simply my CO2 expulsion? Only a bump on my skin filled with histamine and regret. …or perhaps that’s just the anticoagulant in your saliva. My pining for you never will. What does this poem tell me, as an instructor? It tells me that students can express natural history and biology in many different ways. 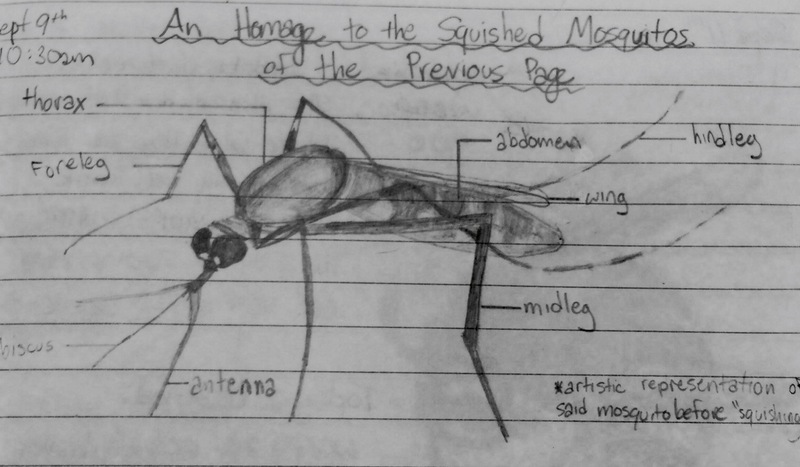 It makes me think that the student will remember the basics of mosquito biology a lot more than had this been on a multiple choice or short-answer examination. It shows the power of allowing emotion to find its tendrils into science. We ought to embrace this a lot more.